If you have curly, dull and dry hair, it possibly needs extra hydration. A hair mask can boost deep moisture in your hair to look it softer, smoother and shinier. Bananas are the perfect ingredient for making your hair mask at home. For the reason that, they are full of minerals, vitamins, and healthy oils that can hydrate and make stronger your hair. They also make a balance of your scalp’s PH level. Mix bananas with other cheap ingredients, such as coconut milk, instead of wasting money on expensive hair treatment. Dear viewers, I intend to provide a homemade banana hair mask recipe for confirming you to get soft, smooth and shiny Hair. 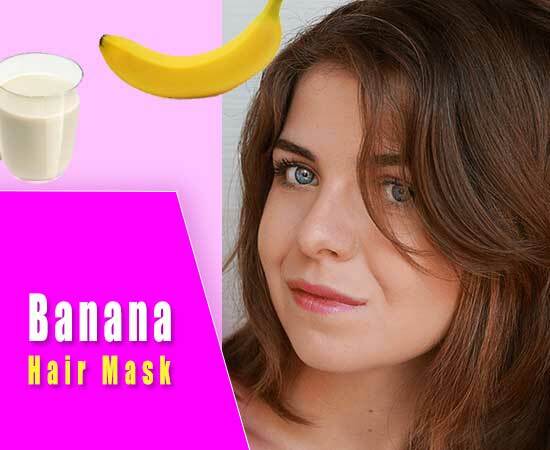 How to Make Banana Hair Mask at Home? The proteins and calcium in milk will make shiner and stronger your hair. Its lactic acid also gets rid of junk to make hair softer. Place banana in a blender and make a smooth paste. Confirm it doesn’t have any thick chunk in the mashed banana. Because your hair may become sticky at the time of washing it out. If your hair is very long, you may require two bananas for making the banana hair mask at home. Instead of using a blender or food processor, you can use a bowl, and a fork to mash them. Then pour the coconut milk into the blender to make a thin consistency. The best option will be adding a small amount of milk firstly, and then see the consistency. Only add more milk if needed later- according to consistency. Use the banana hair mask from the down roots of your hair. If the mask is well in consistency, it will go into the scalp ends for massaging. Confirm using the banana hair mask is entirely drenched. Cover your head using a shower cap or a poly wrapper as if does not fall off your hair. Wait for 15-20 minutes as it will condition your hair deeply. Then Wash off your hair using a regular shampoo. You can go with a conditioner; however, this homemade banana hair mask will naturally hydrate your hair, as if you don’t need another conditioner to use. Confirm rinsing well the banana and coconut milk is out of your hair.